Lock in a great price for Hotel Santa Catalina Panamá – rated 8.8 by recent guests! Great little hotel. 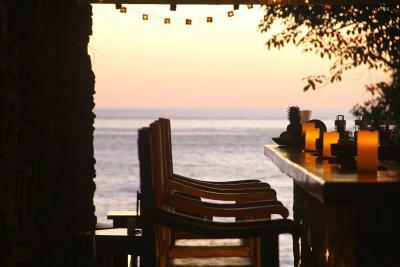 Nice relaxed vibe, nice rooms, friendly staff, beautiful ocean views. Food at restaurant was good. The only small complaints were that the service at the restaurant wasn’t quite up to par, but that is a small flaw and that there was no WiFi in the room, however they had a fast connection at the reception area as well as in the restaurant and pool area, which more than made up for it. I would go back to this hotel without any hesitation. Wish we could have stayed a few more days. Free surfboards, bikes and kayaks are the icing on the cake. Oriel, the Manager also set up a great tour to Coiba for us. Everything. The location, the quaint friendly feel and views. The staff was great. 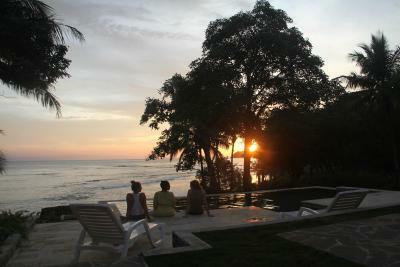 This place is wonderful for everyone from families, to couples, to retreats. The beach is rocky, but walking distance to Playa Estero where there is plenty of sand. 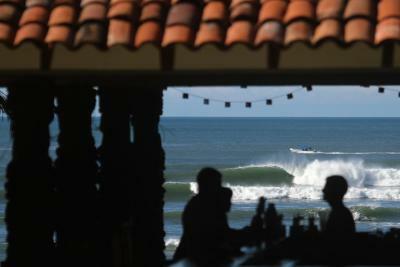 Paddle out to La Punta surf break. Great pool and covered tables and chairs. Room was clean and large for 2 adults and a 5 year old. Great comfortable beds. Hot water! This location had a generator so when other places were without resources, we were never without. Plenty of borrowable boards and ocean gear. Only thing is that the floors are a stained concrete and can be pretty slippery coming in from the pool, ocean or shower, so be careful. Otherwise, not one complaint. We will be back. This hotel and town are worth the drive. 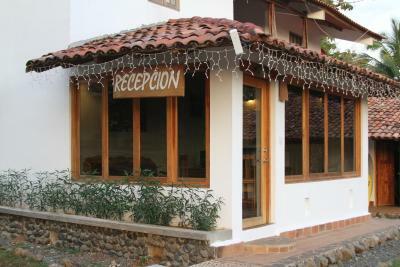 It is the best hotel in Santa Catalina if you are not a surfer or backpacker. The room was clean. Great location. View from restaurant was fantastic. We liked everything about this hotel. The staff was friendly and attentive, the room was comfortable and sparkling clean, the location was superb -- a gorgeous view of the ocean -- and the food was great. The view and location are spectacular. Valentin from maintenance who helped us change a flat tire. The bartender who made sure we had enough to drink. I had a blast at this Resort, the staff was incredible - all were friendly, attentive, and helpful, especially Carlos, Michelle, and Melissa. Thanks guys. The restaurant on the property had delicious food and a wonderful location overlooking the ocean. Convenient, short walk from our room. The food was great. The pool area with the view was awesome. They give you kayak, bikes and boards are free to use whenever you like. Restaurant food is excellent, although attention is a bit slow. Hotel Santa Catalina Panamá This rating is a reflection of how the property compares to the industry standard when it comes to price, facilities and services available. It's based on a self-evaluation by the property. Use this rating to help choose your stay! One of our top picks in Santa Catalina.Hotel Santa Catalina Panama is set on the beach front, 50 feet from the popular surfing spot of La Punta. 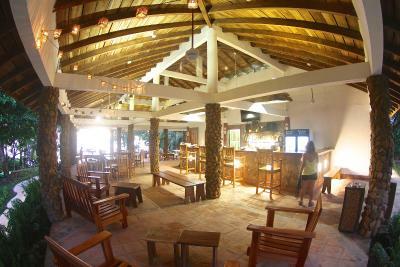 This property is a 12 minute walk from Playa Estero, the sandy beach in Santa Catalina. The Hotel Santa Catalina Panama also includes a back up power generator that provides full electric power. Each air conditioned room at Hotel Santa Catalina Panama has garden views and a private bathroom with hot water and hair dryer. 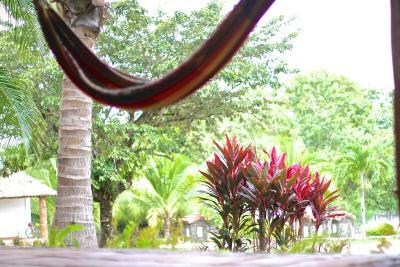 Rooms also have a flat screen cable TV, mini-fridge, security safe, table with chairs and a terrace with hammocks. Free surfboards, kayaks, bicycles and skateboards are provided at the Hotel Santa Catalina. The hotel’s tour desk can also help you arrange activities including snorkeling, scuba diving and fishing trips. Hotel Santa Catalina Panamá is just 0.6 mi from El Estero Beach, while the Coiba Island National Park is around a 1-hour boat ride away. You can drive to David City and airport in 3 hours, or to Panama City in around 5 hours. When would you like to stay at Hotel Santa Catalina Panamá? This functional air-conditioned room has garden views and a private bathroom with a hairdryer. It offers flat-screen cable TV, a fan and a mini-fridge. Daily maid service is included. This functional air-conditioned suite has garden views, a dining area for 3 people and a kitchenette with a microwave, electric stove, mini-fridge and coffee machine. It offers flat-screen cable TV, a fan, a safe and a private bathroom with a hairdryer. Daily maid service is included. This family room has a tile/marble floor, cable TV and air conditioning. House Rules Hotel Santa Catalina Panamá takes special requests – add in the next step! Hotel Santa Catalina Panamá accepts these cards and reserves the right to temporarily hold an amount prior to arrival. Please inform Hotel Santa Catalina Panamá of your expected arrival time in advance. You can use the Special Requests box when booking, or contact the property directly using the contact details in your confirmation. The restaurant was a bit overpriced and the food was disappointing. I never knew an omelette could taste this sad and flavorless. Our stay there was incredibly nice. The pool area is really nice, the view is beautiful. The rooms are quiet and clean; the beds are incredibly comfortable. The bikes available to clients are really useful to reach the town "center" and other beaches. The staff is incredibly nice. Even though the room was generally clean, we had an issue with cockroaches in the bath at night. Of course this can happen given the climate and location, however when we asked for a bug spray or for the room to be cleaned, nothing was done. In general we expeted a better service for the somewhat hefty price tag and the four star status (with exception of the ladies in the restaurant). The hotel is located a ten minute walk from the main road as well as the surf beach and it offers a great view from the pool out onto point break. We liked the free board and bike rental, even though the bikes aren’t in the best condition. We had one of the rooms closest to the pool and restaurant, however, there is no view to speak of from the rooms. The kitchenette was well equipped and the bed was comfy. It is the best hotel you could find in Santa Catalina, you have a beautiful view from the pool, and the staff that works in the hotel is very nice, our room was clean. Lovely setting, nice pool. Restaurant was very average and overpriced for Santa Catalina. Didn’t have a surf town feel about it at all, as do most other places in town. For the price, breakfast should be included in the rate. The energy went off in the middle of the night, but the hotel has backup generators. In the morning, we had no water, which is rather inconvenient in a beach hotel. The stove at the in room kitchenette could have been more powerful. The view and the quietness are amazingly good. Perfect for a relaxing stay out of the crowded places. This is not a 4 star hotel, and I put all in management. I paid for a suite USD 314 for 2 nights my room was never cleaned even after being asked at reception if I wanted the service. The bathroom door handle got stuck and we couldn’t use it for 8 hours. There was no shampoo/conditioner in the shower. The restaurant did not have 2 dishes written on the board (so erase Them) waste of time ended up with a dish of pasta and shrimps that caused food poisoning in my daughter. I know it was this because we have had 4 meals at this restaurant already and have not eaten anywhere else. Too bad because the staff is really wonderful, helpful and friendly (Gin, Micheal and Evelio) and the place is lovely. WiFi is in the restaurant (which shuts down at 10) rather have it in the room. If you are a woman and work remotely like me this is a concern to stay in a deamly lit place after 10. I like the hammocks at the restaurant, the view, the pool deck, the layout, the high ceilings you can tell someone with taste tried to recreate the architecture of a gone by era. You can walk(10 minutes) or a short bike/car ride to Esteros beach to do horse back riding, walking along the beach or learning to surf. There are services near by to the beautiful islands and snorkeling/diving places. Nothing to complain - everything was perfect! 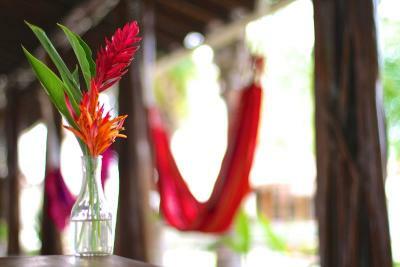 The Hotel Santa Catalina was a highlight on our Panama trip! 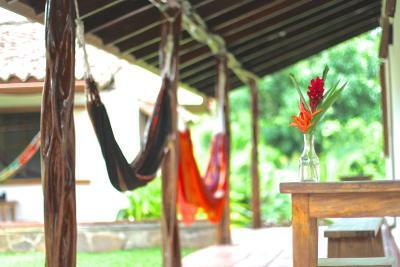 Spacious room with kitchenette, super comfy beds, clean & spacious bathroom, hammock & a place to sit at the outside. Tasty food with fresh ingredients and many options on the menu to choose from (especially for breakfast - which was great after many days of only rice, beans & eggs at other locations). We only booked 2 nights at this place, but then prolonged for another night as we fell in love with relaxing at the infinity pool with a cool beer & snacks served by the attentive waiter and an impressive view of the waves at the sea in front of us. But what really made our stay special was the super nice staff, and especially Pietro - who saved us from starving after we've arrived at around 11pm at the hotel (after an exhausting 8hours journey) with a free pineapple & cereal bars (even though the restaurant was closed already) & arranged a last minute snorkling tour to Isla Coiba for the next day for us. Thanks again Pietro & the rest of the team being such great hosts! We'll definitely come back!